The joker of the Alps has a serious message for the world! Are you worried about our planet? Do you like the mountains, and don’t want to see species such as the marmot disappear? Today, climate change is affecting many ecosystems. Polar regions, coral reefs, our mountains and all their dependent species are at risk. In the Alpine Arc, we have seen an increase in average temperatures of 2°C since the late Nineteenth Century; more than twice the average previously observed in the Northern Hemisphere. Warming will not stop, as we have predicted an increase of 3°C to 6°C by the year 2100. We have also observed a decrease in winter snow cover and a decrease in summer rainfall leading to a low snowpack and accelerated withdrawal of most glaciers. Faced with these environmental changes, many of our mountain species will become extinct if we do not act now! As with the polar bear, the Alpine marmot (one of the most emblematic species of the Alps) is suffering from global warming. To better understand why the populations are waning, and thus prevent their disappearance, the “Alpine Marmot Project” brings together biologists from different backgrounds. 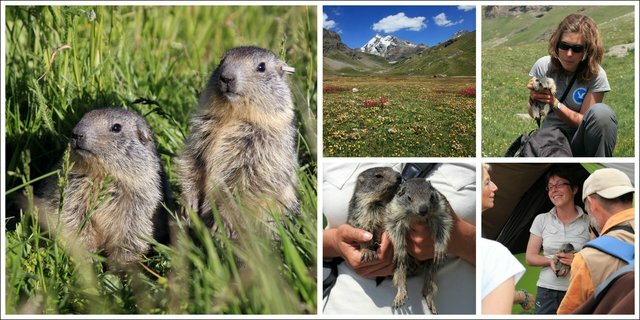 Each year, since 1990, they have tirelessly studied 26 families of marmots within the Grande Sassière nature reserve, in the heart of the French Alps. 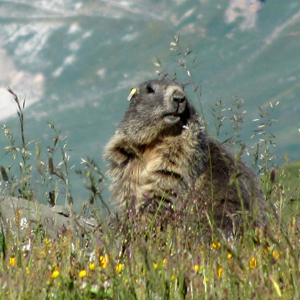 How does climate change affect marmot populations? We want to know which climatic factors (temperature, snow cover …) affect the survival and reproduction of marmots. How do marmots suffer from these changes? Is their physiology or behaviour affected? Evolutionary processes. Can marmots adapt quickly to new conditions? Our work has helped reveal an important decrease in the number of offspring over the years directly linked to a decrease in the thickness of snow in winter, which foretells a bleak future for our four-legged friends. It is for this reason that your support for this project is vital and urgent!